It has long been held that parity reduces risk of breast cancer. However, accumulating evidence indicates that the effects of parity, as well as breastfeeding, may vary according to estrogen receptor (ER) status. We evaluated these associations in a case–control study among African-American women in New York City and New Jersey. In the Women’s Circle of Health Study, including 786 African-American women with breast cancer and 1,015 controls, data on reproductive histories were collected from in-person interviews, with tumor characteristics abstracted from pathology reports. We calculated number of live births and months breastfeeding for each child, and examined each in relation to breast cancer by ER status, and for triple-negative (TN) breast cancer. 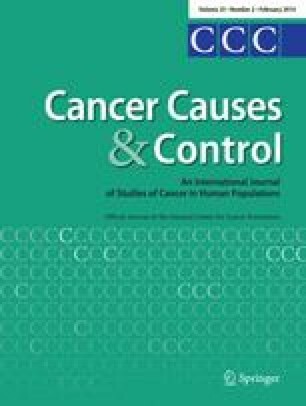 Although associations were not statistically significant, having children was associated with reduced risk of ER+ breast cancer [odds ratio (OR) 0.82, 95 % confidence interval (CI) 0.58–1.16], but increased risk of ER− tumors, with associations most pronounced for TN breast cancer (OR 1.81, 95 % CI 0.93–3.51). Breastfeeding gave no additional benefit for ER+ cancer, but reduced the risk of ER− disease associated with parity. Accumulating data from a number of studies, as well as our own in African-American women, indicate that the effects of parity and breastfeeding differ by ER status. African-American women are more likely to have children and not to breastfeed, and to have ER− and TN breast cancer. It is possible that breastfeeding in this population could reduce risk of more aggressive breast cancers. This work was supported by Grants from the US Army Medical Research and Material Command (DAMD-17-01-1-0334), the National Cancer Institute (R01 CA100598, P01 CA151135, K22 CA138563, P30CA072720, P30 CA016056), the Breast Cancer Research Foundation, and a gift from the Philip L Hubbell family. The New Jersey State Cancer Registry (NJSCR) is a participant in the Centers for Disease Control and Prevention’s National Program of Cancer Registries and is a National Cancer Institute Surveillance, Epidemiology, and End Results (SEER) Expansion Registry. The NJSCR is supported by the Centers for Disease Control and Prevention under cooperative agreement 1US58DP003931-01 awarded to the New Jersey Department of Health. The collection of New Jersey cancer incidence data is also supported by the National Cancer Institute’s SEER Program under contract N01PC-2010-00027 and the State of New Jersey. The funding agents played no role in design, in the collection, analysis, and interpretation of data, in the writing of the manuscript, or in the decision to submit the manuscript for publication.